How often do we look into the mirror and ponder. Do I really like what I see? You will always want to be more perfect, a little thinner, curvier, tanner or muscular. But next time when you stand before the mirror just give a few seconds to the thought of those who live in this world with many organs missing or dysfunctional. Rather than thinking of improving your own looks, you could actually do something for those struggling to live without a fully functional body. You can be an organ donor. There are lot of fears and phobias regarding organ donation and here let us see if some of these tips help you make a decision. Imagine a huge football stadium overflowing with people and that could be the number of people in your country waiting for an organ. As science advances and medical technology grows there is more and more possibility for a dying person to hang on to life and maybe return to a normal life. In fact everyday the number of needy people are growing but the number of organ donors are not equal to it. If you have ever dreamt of changing a little bit of this world an its miseries this may be an opportunity. It is estimated that instead of confining your body to a deep grave or burning it on the pyre, your single body can save up to 8 lives and enhance the quality of life for 50 others. These could be the people who will bring about a change in the world that your future generation will benefit from. There are many who think that you are too young for organ donation, but it is just a myth. Organ donation stretched beyond barriers of age and young and old can participate in it. Organ donation is beyond any religion be it Christianity, Judaism, Hinduism or Islam. 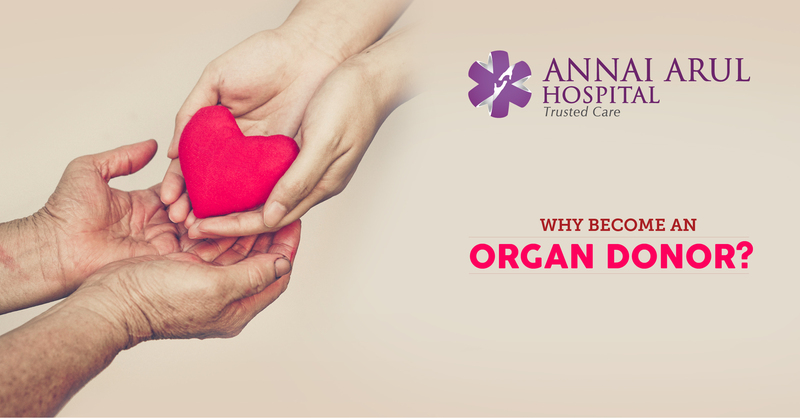 Organ donation is a universally accepted thing and does not transgress any religious beliefs. If you still feel that you are unhealthy and suffering from some kind of medical condition, remember that except the dysfunctional organ you can commit to donate your healthy organs and they will work to save many lives. There is no need to explain that organ donation is a heavenly act that humans can perform even when they are no more on this earth (organs are harvested only after death). So many pray to god to restore their life or the life of their dear ones and you can be an angel who will enable God to answer their prayers. There is a misconception that organ donor will be single out and will not receive proper treatment at hospitals. On the contrary organ donors will be doubly checked to see if there is any chance of their survival and the death is confirmed after a number of tests. The medical care you get will be the finest irrespective of whether you are a organ donor or not. As every organ donor and the donor family knows there is not responsibility on your part or your family related to the donation. After registering for organ donation and paperwork you can be assured that there no costs involved in organ donation and all the process is undertaken by the organization that has signed you. Human psyche is so adaptable that being assured that your organs are functioning in a needy person will comfort your family. Sometimes the donor’s family meet the recipients and there are instances when they felt an immediate connect. The family will be proud of your noble act and feel relived that you have served God’s will even when you are not physically present.